The MOYE Victory Starting Blocks- Is Quicker Better? The Moye Starting block concept is simple. The angles of the blocks are much different than conventional starting blocks. The rear block has a very steep angle, and the front block has a low angle for the heel of your front foot. The front shoe has the spike plate and needles in contact with the synthetic track surface. The sprinter has a higher hip position than the conventional starting blocks which will result in a greater vertical force than a horizontal force when leaving the blocks. Thus the sprinter will get out “quicker”, with quicker steps and turnover, but at the expense of horizontal power. Quicker may not necessarily mean “faster” in terms of relative time, which is how Track and Field running events are measured. They do not give points for style (at least not the last time I checked). So when they claim you can “Get Out Quicker”, they are correct, but you really need to see the whole picture. However, an athlete with a lack of power using conventional starting blocks would benefit from using the Moye blocks. This would include Youth athletes and veteran Masters athletes. This research study was performed by Dr. Pierre Gervias and Steve LeBlanc. Steve was a PhD (provincial candidate) University of Alberta and is currently the Atlantic Region Head Coach for Athletics Canada. The original paper can be found here. The purpose of this research project was to examine the biomechanics of a sprint start from Moye blocks as compared to standard starting blocks. Below is a summary of their conclusions. 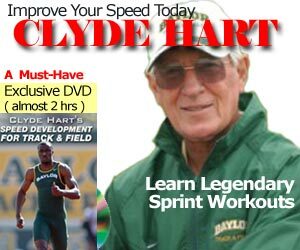 The faster RT recorded on the Moye block starts did not seem to translate into faster sprint times to any of the interval distances. It may be that the faster RT were caused by some artifact of the interaction of the Moye block and the ReacTime units. In fact, only 3 out of 94 recorded trials were deemed to be false starts by the ReacTime units (and subsequently not included in calculations of average RT), and all three of these were during trials on the Moye blocks. It may be that something in the block configuration makes it result in faster recorded RT – this may have implications for athletes using the Moye block in competition since major competitions typically make use of false start detection equipment, like the ReacTime units used in this study. Further research will be required to clarify this point. Issue with conventional blocks is trying to start as if you are standing up. MOYE blocks are a good alternative but yes being quicker does not mean being faster. Issue with both set of blocks is the mis-use of the ball of the foot. The ball of the foot is key to applying forces and both style of blocks shorten ball of foot contact time or reduce it tremendously. In the end the impulse is not great as the force is low and the contact time is short. Kangaroo Starting Blocks is the best way to increase your impulse at the start. Have found that with high hurdles (HS), the Moye block is the preferred choice for getting to that initial stick! Which sets up the second one nicely. Before it was mandatory to use the 4 point starting block position (for the pressure pads and detecting false starts) it was not uncommon to see 110mH use only one rear BLOCK for their start.